Each year, when December rolls around, I always feel a bit like I just want January first. But, in the midst of this season, it seems that life has hardly any normalcy. This year, when I peek at the calendar, it seems that even more is "non-normal" this Christmastime. Josh is graduating in less than two weeks (whoop! ), we have a baby, family is coming, family is leaving, we are traveling, etc, etc, etc. Because of that, I look at January first and just wish for it because it means more normalcy and a fresh start. So, when I saw that Hayley at the Tiny Twig was hosting another "goals" link-up, I knew that it would be the perfect opportunity to gather up a list of what-I-really-want-to-do-during-this-season goals. I think it will help me zoom in and focus on a few important things so that I don't feel defeated at the end of the month. Celebrate Josh's graduation with just the two of us. So, this one is kinda cheating because we already have a date lined up. But, I really want it to be a sweet and intentional time for just the two of us. Clean my house before our Christmas travels. It might seem simple, but I really want to clean, clean it--as in actually-sweep-and-dust-and-stuff before we leave. Buy an ornament for Josh + Luke. We have a tradition of buying one another a new ornament (one that represents this year) every Christmas. But, last year we slacked off and didn't do it. This year, I'm going to find one and not give up the tradition just because of one missed year. Bake a different Christmas cookie. I've made the same-old cookies every year. But this year, I'm going to branch out a try a new one. Any suggestions? SO SO good. :) I am so interested to know what Christmas cookie you make! And yay for graduations and eBooks! It's gonna be a full and sweet season for you, I can already tell! xo. excited to see your ebook! for cookies - i just pumpkin molasses cookies and they were uuuuhhh-mazing. from smitten kitchen blog. so that's my suggestion. 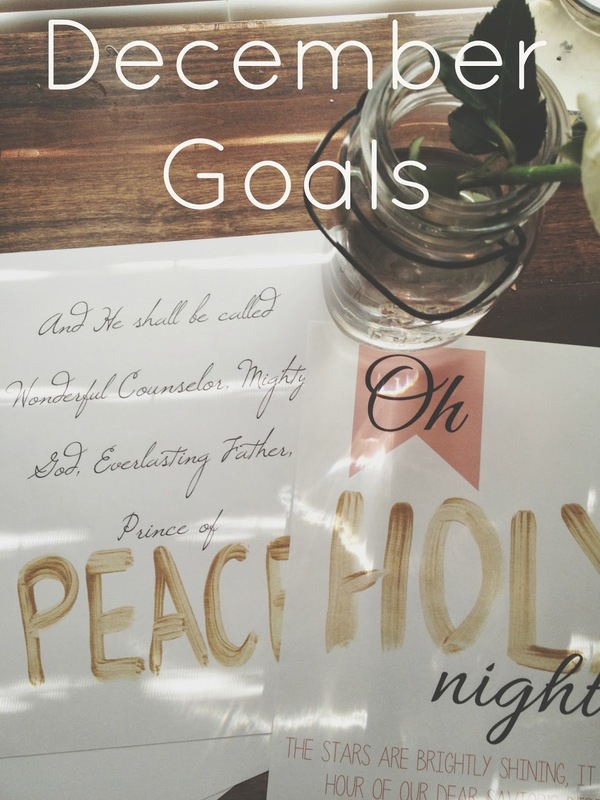 :) i posted goals for the first time this month too - guess it's good practice for starting off the new year right!